Neoliberal capitalist dogma pervades mainstream media. A case in point is coverage of Andrés Manuel López Obrador’s resounding victory in Mexico’s presidential election. Referring to the president-elect by his commonly used acronym, the New York Times’ Azam Ahmed and Paulina Villegas (7/1/18) claimed that"
one of AMLO’s biggest challenges will be to convince foreign investors that Mexico will remain open for business. If he fails to convince the markets that he is committed to continuity, or makes abrupt changes to the current economic policy, the country could find itself struggling to achieve even the modest growth of prior administrations. According to the authors, keeping Mexico “open for business” for “foreign investors” should be a priority, a call for maintaining the economic status quo in a country where nearly half the population lives below the poverty line. Ahmed and Villegas suggest that “continuity” is necessary, even as they themselves say earlier in the article “that the nation’s desire for change outweighed any of the misgivings the candidate inspired”; evidently pleasing “the markets” matters more than carrying out the will of the populace. Poverty is worse than a quarter century ago, real wages are lower than in 1980, inequality is worsening, and Mexico ranks 18th of 20 Latin American countries in terms of income growth per person in the 21st century. 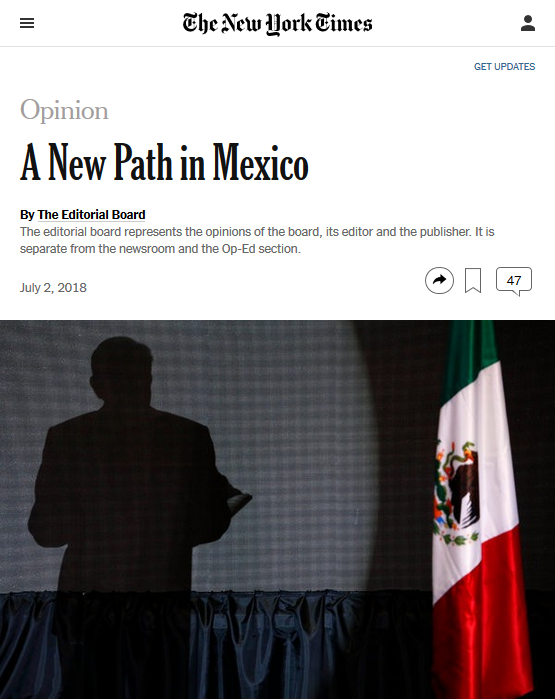 Another New York Times article (7/2/18), this one by Ahmed and Kirk Semple, said that López Obrador “must still convince investors that his policies will be business friendly.” Ensuring that “investors” are happy is apparently a nonnegotiable imperative.  Revealingly, the authors failed to consider how this supposed essential can co-exist with another necessity they describe, which is that “Mr. López Obrador will also have to deliver on his promises to address widespread poverty and yawning inequality.” Ahmed and Semple decline to point out the contradiction here: “Investors” rarely deem policies that “address widespread poverty and yawning inequality”—say, a higher minimum wage and the redistribution of wealth through social programs—to be “business friendly.” By glossing over such inconsistencies, and proffering magical thinking according to which capital can be appeased while poverty and inequality are successfully fought, the authors performed a service for advocates of neoliberal capitalist scripture. It may be that Mr. López Obrador’s promise of radical reform will amount to reversing the hard-won progress of his predecessors in shifting the statist, autocratic Mexico of the 20th century toward a modernizing liberal democracy. The new president…is likely to slow a partial privatization of the oil industry. According to this perspective, privatization is synonymous with “progress.” A society advances, it would seem, when profits from and control of its resources are taken from the public and turned over to a small number of wealthy, unaccountable people. Mr. Trump has badgered Mexico since he announced his candidacy, criticizing its migrants, threatening to abandon the North American Free Trade Agreement and promising to build a wall between the two countries. The ideology of pro-corporate trade deals runs so deep that the possibility of ending NAFTA is presented as being as dangerous and as contemptible as racist slurs against migrants and plans to further militarize the US/Mexico border. Neoliberal capitalist orthodoxy bifurcates the world between believers and unbelievers, often without parsing the differences among the heretics. Thus, as I wrote for FAIR (6/26/18) shortly before Mexico’s election, Trump and López Obrador are lumped together, even though the former is a racist warmonger who has given the rich $5 trillion and has boasted of sexually assaulting women, while the latter has a record of solidarity with campesinos and indigenous people, subsidizing transit, and providing stipends to seniors and single mothers. is a product of the political left, but his victory is part of the global story of rising populist leaders. 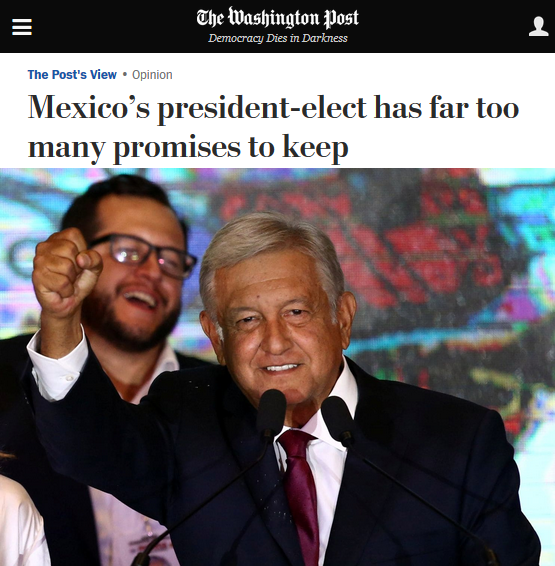 Like many of them, including President Trump, Mr. López Obrador promises to overturn the reigning political establishment, says he alone is capable of delivering on his far-fetched promises, and assails the media, courts, civil society groups and all others who might check his personal power. Like other populists, the incoming Mexican leader also has been vague and occasionally contradictory about the specific policies he may pursue, even while insisting he will bring about a “transformation” comparable to Mexico’s achievement of independence. In that, he is sure to fail; the question is how much damage he may do to the democratic system that enabled him to gain power. the allure of López Obrador message is steeped in the language of nostalgia for a better time….In this way, and others, the parallels between Mr. López Obrador and President Trump are hard to ignore. Both men are tempestuous leaders, who are loath to concede a political fight. Both men lash out at enemies, and view the media with suspicion. These comparisons between the two politicians are ankle-deep, overlooking as they do that Trump has sought a massive increase to the hundreds of billions of dollars that the US spends killing people around the world, while López Obrador has promised to launch a public-works program to employ 2.3 million young people and to raise pensions for the elderly. The neoliberal capitalist catechism also manifests itself by maligning those who have challenged its doctrines with any degree of success. This is evident in coverage of AMLO’s win that considers the commonplace comparison between him and the late Venezuelan President Hugo Chávez. When corporate media outlets examine this analogy, they do so on the assumption that it will be bad for Mexico if López Obrador adopts policies similar to Chávez’s. 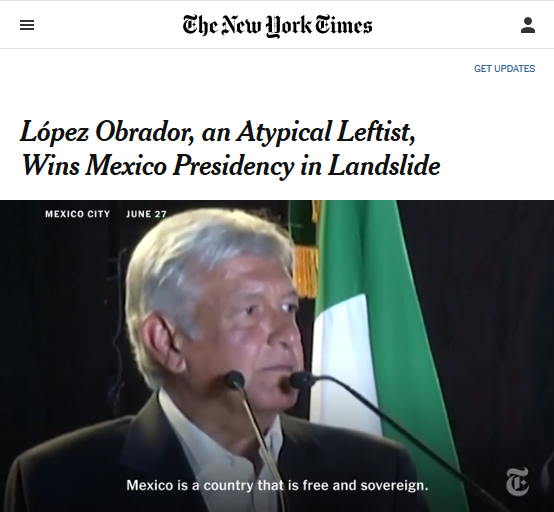 A New York Times editorial (7/2/18) asked whether López Obrador was like Chávez or Trump or both, and concludes that “unlike Mr. Chávez and Mr. Trump, the president-elect is a lifelong politician with firm faith in democracy.” The accusation that Chávez was undemocratic is false. Every election he won was certified free and fair. When Chávez was president, the Venezuelan government launched a program called Barrio Adentro (“Inside the Neighborhood”), designed to foster mass political participation and improve public health, that proved to be “especially popular with the poorer sections of the society” (Globalizations, 1/3/13). Ahmed and Semple take for granted that Chavez “[sunk] the economy,” but when Chávez was leader, Venezuela’s rates of poverty, inequality, illiteracy, child mortality and malnutrition sharply declined. If that’s what it means to “sink the economy,” one could be forgiven for hoping AMLO’s nautical skills are in line with Chávez’s.